Everything is better with Lego, or so it goes in our family. If you have kids under ten-years-old in your house, you probably understand what I mean. Why, my husband is far from that age, and he had been telling me stories about hours spent with Lego long before our son reached the stage when he could connect two blocks together. And when Budster was ready, we were even readier to jump into the world of Lego. It has been two years, and we have enjoyed Lego birthdays, Lego stocking fillers, and Lego travel packs. 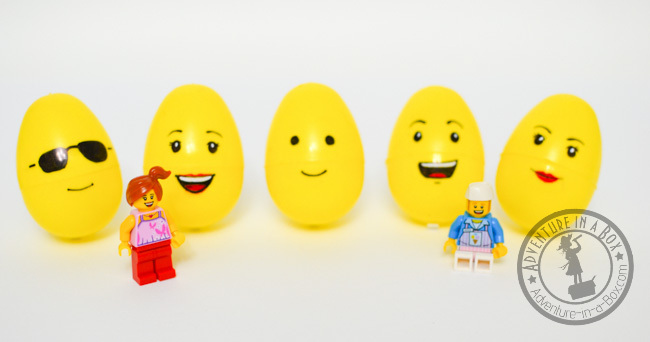 So for Easter this year, we had to make Lego eggs! 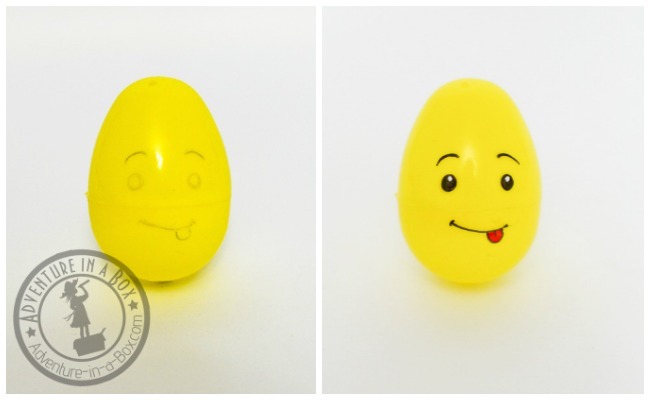 We used plastic eggs to fill them with these small spring-themed Lego sets, but there is no reason why it cannot be done with real eggs if you dye them yellow first. 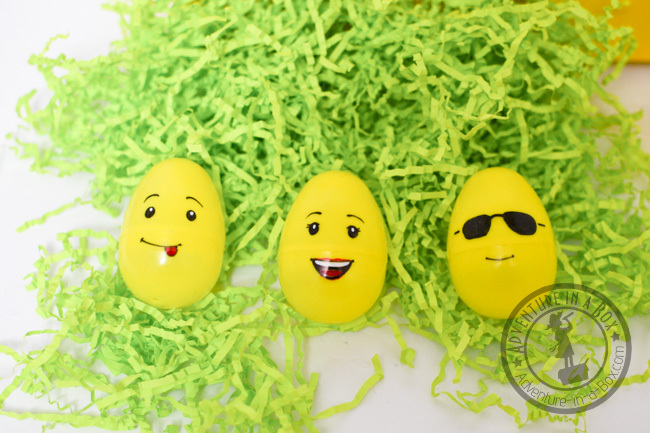 As for the plastic eggs, it’ll be lucky if you can find a bag of yellow ones. I bought four packages of assorted colours and picked all the yellow eggs out. Not a big deal as I’m sure there’ll be enough treats to go in all the eggs. The only other things you’ll need are Sharpies. I used ultra-fine, but fine can also work. 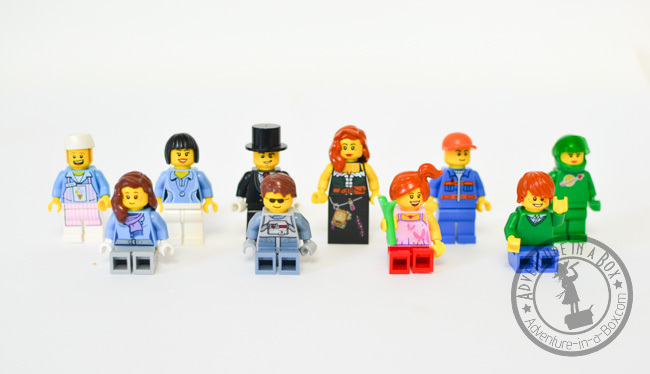 If you like the old-school Lego faces, you won’t need anything but black and red, and those markers are often found a set. To reproduce a more modern look, I also got a white marker. Afterwards, I noticed that the newest Lego faces also use a little bit of brown, which I didn’t have. It was fun to sort through our collection of figurines, looking for inspiration. Most of these guys are from the modern sets. 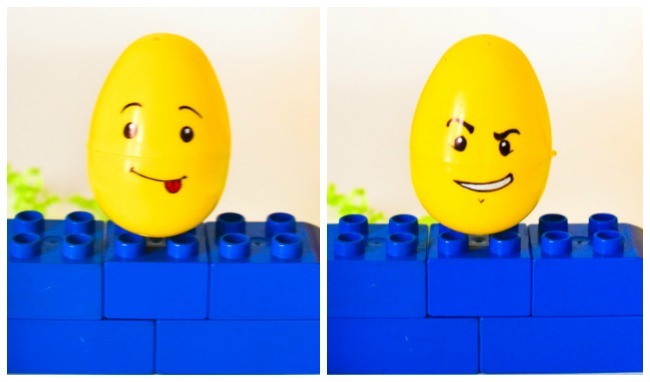 Lego has sure developed a lot of various expression! While it may be a question whether such detailed expressions really contribute to the yellow guys’ play value, I certainly like the new female looks with light lipsticks and genuine smiles better than the old-school pouty-lipped wenches. Once you have the inspiration, it’s time to draw. To get the proportions right, we first quickly sketched the facial features with a soft pencil, then went over it with markers. 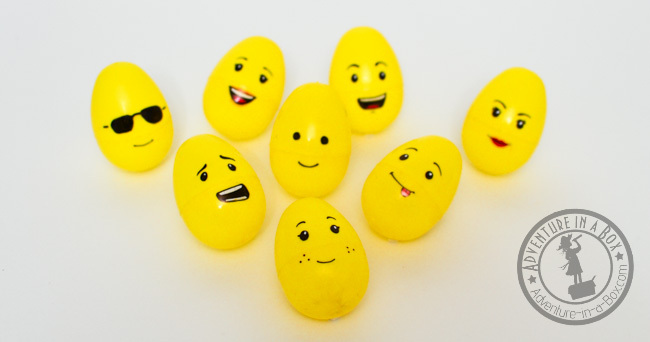 In no time at all, we had a number of Lego expressions in egg form. 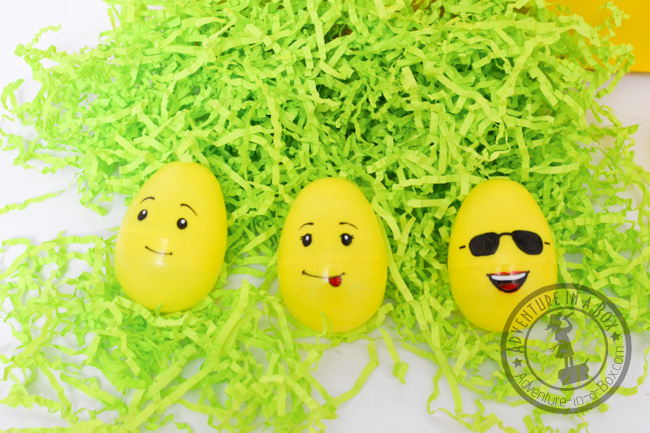 Creating them was so much fun that some of the eggs got two expressions – on the front and on the back. That was our imitation of double-sided faces that Lego introduced in the 2000s. My son was very excited about the Lego eggs, and as soon as they started lining up on the table, he began inventing games to play with them. I thought that some of them were pretty good! 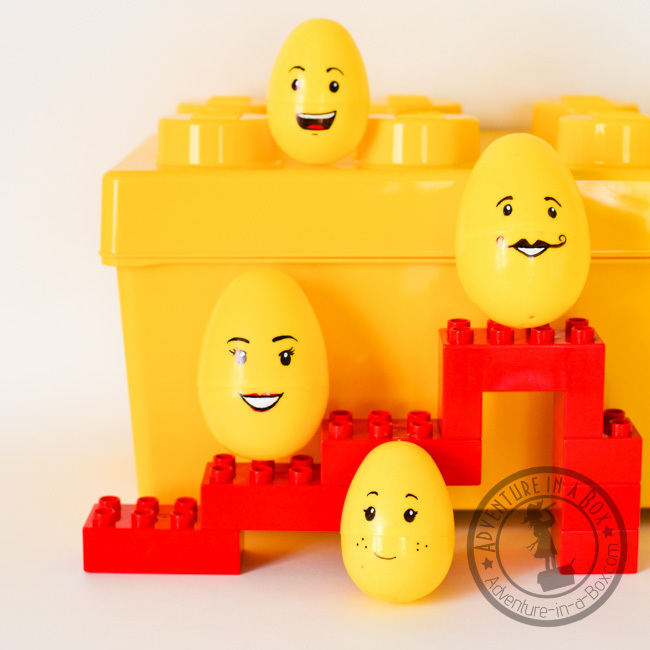 There’s hardly a thing that a kid cannot play with if he uses imagination, but Budster’s idea of pretending that Lego eggs were a family took an especially sweet turn. First, he found a bigger bunch of eggs. He asked me to draw Mommy and Daddy, then picked a happy looking egg from the set of little ones and proclaimed that it was Budster. The last egg went inside of a bigger egg, and he pointed out that it was “a baby inside Mommy”. Then he hastily took “the baby” out, saying it was time to come out! He seems more than ready to have a new baby in the family. Coming in two months! This is our family portrait, according to Budster. The baby is out, and Budster is jumping on the roof! 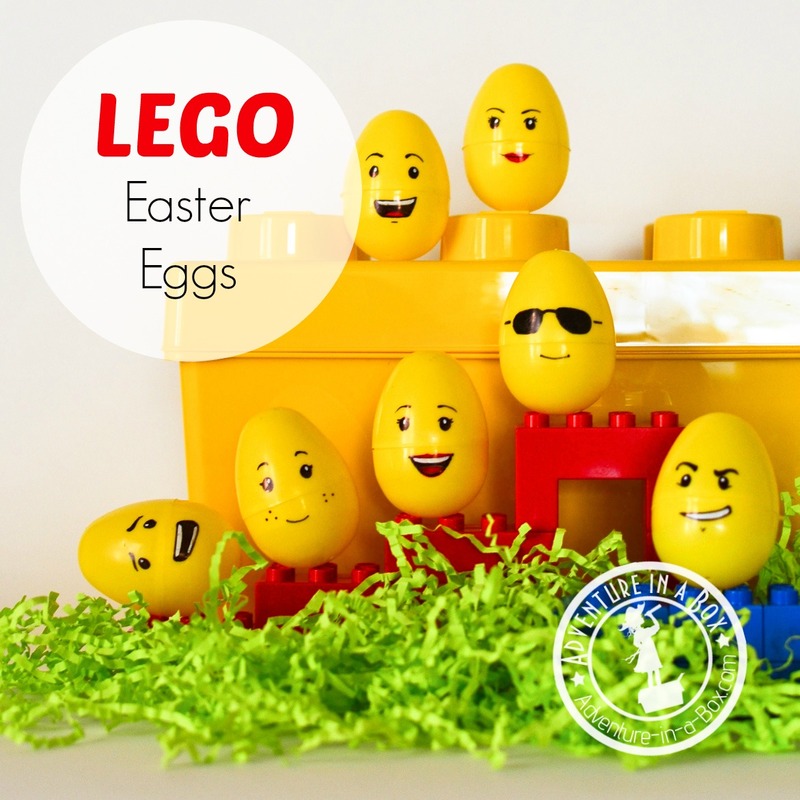 Come Easter, we’re going to fill these eggs with little Lego sets and go on a Lego hunt! Love this idea and plan to do it for the grandkids. You show 12 items but only have instructions for 10. I know the girls would love the ice cream truck. Would you please post the other 2 items? Your ideas are wonderful! Thank you so much.